Document imaging (or document scanning) is the conversion of paper documents into electronic images (or electronic documents). Once converted into electronic documents, they can be easily viewed, distributed, stored and retrieved easily from your computer or digital library. 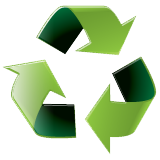 Meridian Outpost offers you great savings by converting your paper liability into a digital resource. Document imaging eliminates cost associated with file cabinets, floor space, lost files, printing, and copying and significantly increases the speed of retrieving archived information. Many businesses and other organizations have realized the benefits of electronic documents and have started converting their paper documents into electronic form. Meridian Outpost can generate electronic version of virtually any type of paper documents. 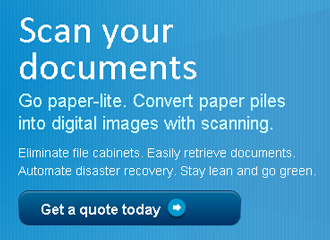 We'll digitize your documents and generate PDF files of them. PDF is a file format developed by Adobe® that is widely used and accepted across the world for electronic documents. Once in PDF file format, your documents can be easily stored, accessed, distributed and printed from either Macintosh®, Windows®, Linux, UNIX®, or OS/2 platforms. For more information on the benefits of Adobe PDF document, please read Benefits of Adobe PDF File Format. Contact us to find out how we can help you manage documents in the new millennium or get your free quote for your next document scanning project.